Dr. Livingstone, abolitionist I presume? Everyone has heard the phrase, "Dr. Livingstone, I presume," but most probably don't know much about the background that led up to that famous quotation. The book The Daring Heart of David Livingstone takes a look at the famous explorer, but focuses on his dedication to eradicating the slave trade in Africa. David Livingstone was born into humble circumstances in Scotland in 1813. He very early developed interests in both science and missionary work. The London Missionary Society sent him, as an eager young recruit, to East Africa in 1841. During his 15 years of work there, he performed the astounding feat of walking across Africa, from the Atlantic Ocean to the Indian Ocean -- a journey that took 3 years. During that time, he became alarmed at the slave trade that he observed. Famous Englishmen such as William Wilberforce, William Pitt and Charles James Fox had successfully campaigned to end slavery in the British Empire. In fact, most British citizens, at the time of Livingstone's work, had no idea that slavery was still going on in Africa. However, due to geographic and financial limitations, the only real business being done in Central Africa at the time involved ivory and slaves. It was a difficult job to get the ivory from the interior of the continent to the coasts where it could be shipped to Europe, so unscrupulous traders quickly established the practice of forcing people to work in transporting the ivory, and then, once they reached the coast, selling the workers as slaves. During Livingstone's early African expedition, his main goal was to establish a trade route for African goods that would give the tribal chiefs income from commodities other than their own people. Tales of his exploits enthralled the folks back home in Britain -- who were witnessing the decline of the British Empire. His many contributions included new information about insects, weather, geology and medicine (he pioneered the use of quinine as a treatment for malaria). When he returned home to seek funding for another African missionary trip, he was dismayed to learn that the London Missionary Society was not very impressed with the lack of converts he'd collected. His trade plans and explorations were of little concern to them. They refused to fund further expeditions. Luckily, at the same time, the Royal Geographical Society had taken note of his many achievements and was able to persuade the government to offer him the position of roving British Counsel to East Africa, at a hefty salary. In addition, they offered to fund his expedition to discover if the Zambezi River could be used for navigation for trade purposes. Tired of depending on the slave labor United States, Britain was also eager to find alternative sources for growing sugar and cotton, and Livingstone was certain that there was plenty of fertile farmland available in Africa. As with most things in his life, Livingstone's second expedition encountered many problems. He traveled with a number of men with helpful skills, including a botanist, an engineer and a geologist. His wife and young son initially accompanied the group, but when it was discovered his wife was pregnant, she was left behind in South Africa to have the baby. The remaining group headed up the Zambezi in a steam ship. Once the water became more shallow (faster than they had anticipated) they had to transfer their supplies into a smaller ship, the Ma-Robert. This enterprise took six months! When they did eventually continue on the journey, they were soon forced to turn back due to extreme currents and waterfalls. So the expressed purpose of the journey, finding a trade route along the Zambezi, was a failure. Still, Livingstone was not defeated (even if his crew was by this time disheartened and thoroughly sick of their morose leader), and decided to investigate another river, the Shire. Unfortunately, the area around the Shire River was the prime hunting grounds of the slave traders, so the locals were understandably alarmed by and hostile toward this new group of strangers. When the Shire also proved to have non-navigable rapids, Livingstone turned to a new idea: establishing a British colony in central Africa that would allow the poor of England to migrate and establish Christianity in Africa. Unfortunately, these plans didn't work out either, and a disheartened Livingstone returned in London. His reception was vastly different from that he received upon his previous return. The public and politicians had believed all of his grandiose talk of navigable rivers, a good climate, and a hospitable place for Christianity to take root. Still, he wrote a new book about his most recent travels and attempted to get Britain more involved in eradicating the slave trade. Livingstone's third and final expedition was funded once again by the government. This time, the purpose of the journey was to discover the source of the Nile. Livingstone planned to use the trip to continue his anti-slavery campaign. Unfortunately, this trip was plagued by problems: lack of food, desertions among his men (including one who took all the group's medicine), diseases and heavy rains. Additionally, the slave raids were continuing at a more alarming rate than ever before. To make matters worse, in 1866 word reached Britain that Livingstone had been killed by a party of armed raiders. While the world worried, in truth Livingstone was not dead (although he wasn't exactly in the prime of health), but he was lost somewhere in the wilds of Africa. News that he was still alive eventually reached a relieved British public, but as Livingstone's supplies were plundered and he faced increasing difficulties, he was unable to get correspondence out. With the whole world waiting for news, Henry Morton Stanley, a "traveling journalist" was given the assignment (along with a seemingly endless expense account) by the editor of the New York Herald to find Livingstone. Stanley encountered the same harsh conditions as Livingstone had, but after 8 months, he was able to greet the man with the phrase that has become so well-known. He even joined Livingstone for a time in his continuing efforts to find the source of the Nile. When Stanley left to return to the US with his newspaper scoop, he brought along a letter from Livingstone outlining the horrors of the slave trade and imploring the world to do all in its power to stop it. Even though he didn't live to see it, his efforts eventually had the desired effect of getting Britain involved in eradicating the slave trade in that part of Africa. I really enjoyed learning more about this man and his dedication to stopping the slave trade. His tireless efforts for so many years no doubt saved many lives. 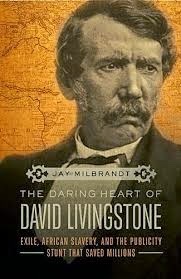 Disclaimer: I received a copy of The Daring Heart of David Livingstone from BookLook Bloggers in exchange for this review.